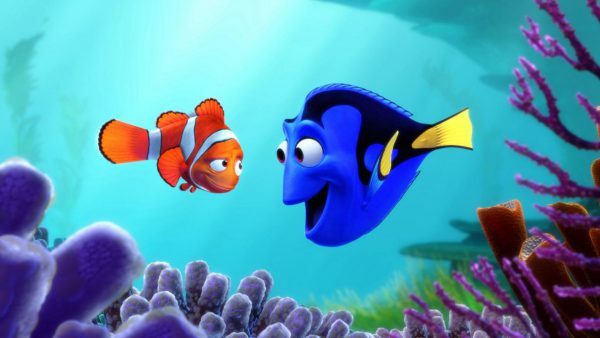 Pixar is back with Finding Dory, the sequel to their wildly successful 2003 hit about a timid, overprotective clownfish who teams up with a forgetful blue tang in order to track down his handicapped son who was captured by scuba divers. 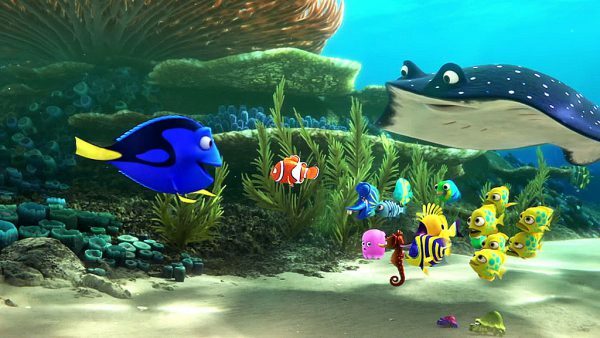 Finding Nemo was made for $94 million and it went on to make almost $940 million. With that kind of profit and brand recognition it was only a matter of time before Pixar jumped back in the ocean. 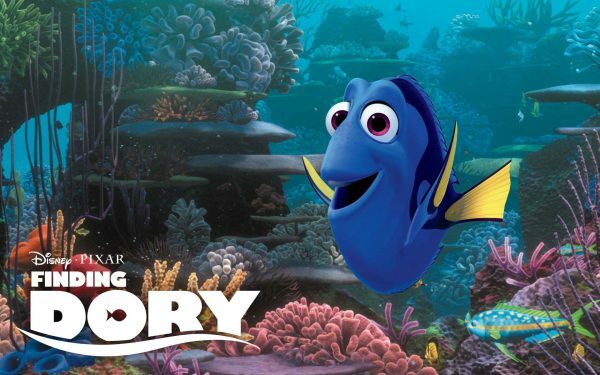 This time around, the movie focuses on Dory (voiced by Ellen DeGeneres), the silly blue tang who suffers from anterograde amnesia (short-term memory loss). While Dory is quite funny in Finding Nemo, I thought that making her the star of the movie could possibly lead to a Cars 2 situation. Let me explain; while I’m not a fan of either Cars movie, the sequel is especially bad because it takes Mater — a goofy supporting character from the original — and it makes him the star. Mater’s more palatable in small doses and I thought that might be the case for Dory too, but I never found her annoying in Finding Dory, in fact, I thought she was endearing. 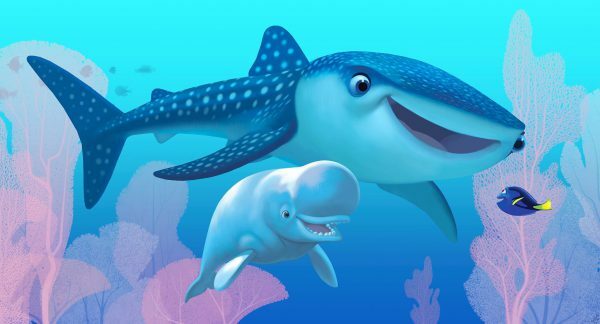 After an opening segment that shows an adorable, big-eyed, baby Dory with her parents (voiced by Diane Keaton and Eugene Levy), and her subsequent separation from them, she drifts along, lonely and lost, eventually bumping into Marlin (Nemo’s dad, voiced by Albert Brooks). 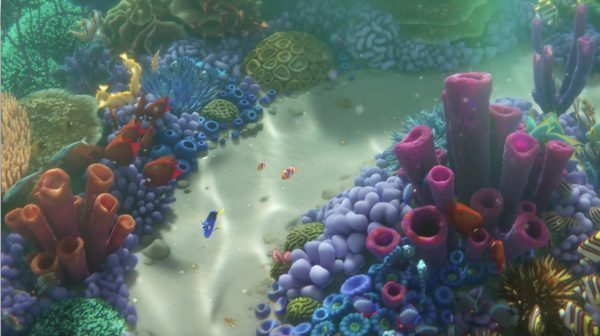 This is the first time they met (as depicted in Finding Nemo) and Finding Dory picks up one year after their fateful encounter. 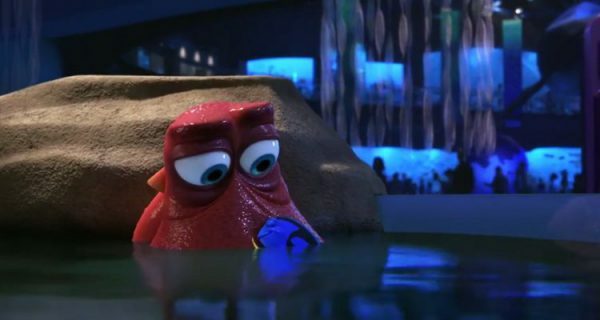 Fragments of old memories come back to Dory and she starts to genuinely miss her parents. She follows the memories like clues and before you know it, Dory, Nemo, and Marlin are caught up in a cross-ocean adventure in search of her parents. The movie is fun, it boasts polished animation, and it introduces some groovy new characters. High marks to Ed O’Neill as Hank, a clever octopus missing a tentacle, and Idris Elba and Dominic West (Stringer Bell and Jimmy McNulty from The Wire) as Fluke and Rudder, a couple of hilarious sea lions who are overly protective of the highly coveted, sun-toasted rock they lay on. 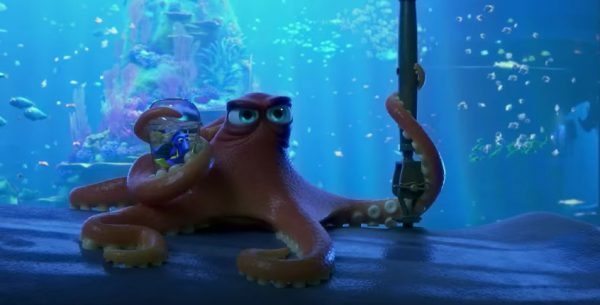 Dory and Hank’s relationship is mutually beneficial. They both have something the other wants. 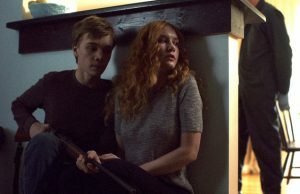 While Hank has the ability to use his size and take what he’s after (or simply trick the easily deceived Dory) he doesn’t, and that makes him compelling. He’s a disgruntled ‘pus, but he sees something in Dory. Perhaps he’s sympathetic to her cause or to her disability, or he’s inspired by her grit or sunny disposition. Maybe he’s just an honorable dude. Whatever it is, it’s a good thing for Dory, ’cause when the movie turns into a big game of Mouse Trap and Dory needs to navigate in and all around the Monterey Marine Life Institute, she’d be stuck without her seven-legged chauffeur. The movie couldn’t function without him. 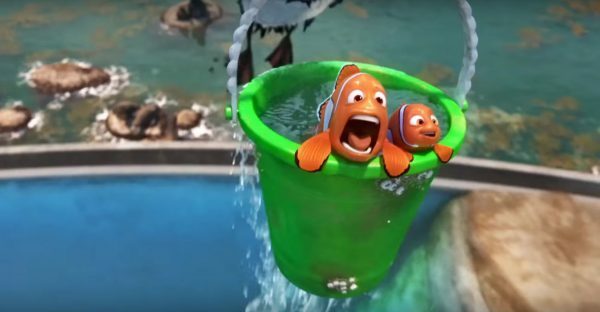 While Dory’s condition is a running joke in the first film, it’s treated as a disability here. They still mine it for humor, but it’s handled tenderly. Watching her strive to achieve her goal despite her issues with memory reminded me of Guy Pierce’s character in Memento and Christopher Plummer’s in Remember. 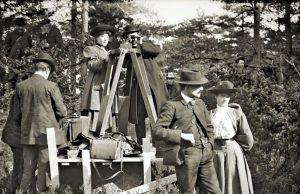 In those films, the characters devise ways to remind themselves of the mission they’re on. Dory doesn’t cover herself in tattoos/clues and she doesn’t carry around a letter that tells her the explicit details of her plan. When there isn’t someone there to remind her of the task at hand, I’m not sure what propels her. 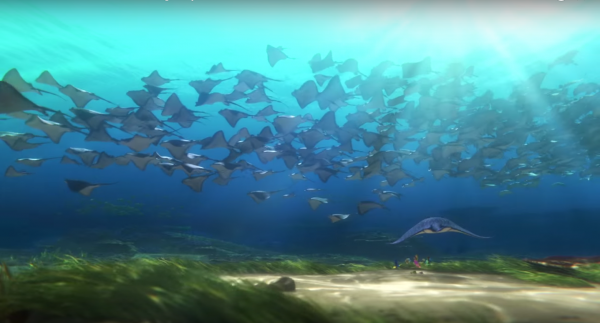 Finding Dory pushes absurdity to its limits. I went along with it, but others might not be so forgiving. There were times when I thought really? or just shook my head and chuckled as I watched the ridiculous events unfold on screen. Fish jump from fresh water to salt water with no repercussions, creatures hop barricades built to contain them like it’s nothing, and (*MINOR SPOILER ALERT*) Hank even drives a car. Everything comes together a little too conveniently for the protagonists. 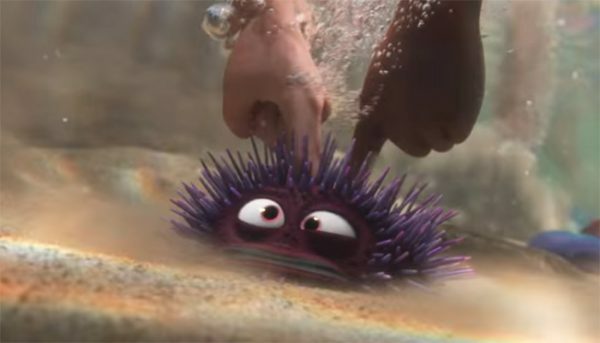 The movie is a blast, but it’s not as tight as the original and it never reaches the emotional heights of other Pixar films like Inside Out and Up. It clearly wants to, but the message is muddled. They repeat the phrase, ‘What Would Dory Do?’ and I’m not exactly sure what that means. Just keep swimming? Plunge ahead obliviously and rely on impossibly good fortune and the unflinching generosity of others to get you to the promised land? Cute, but it doesn’t seem realistic. The movie looks great. I enjoyed the different locations and the varied appearances of the environments. 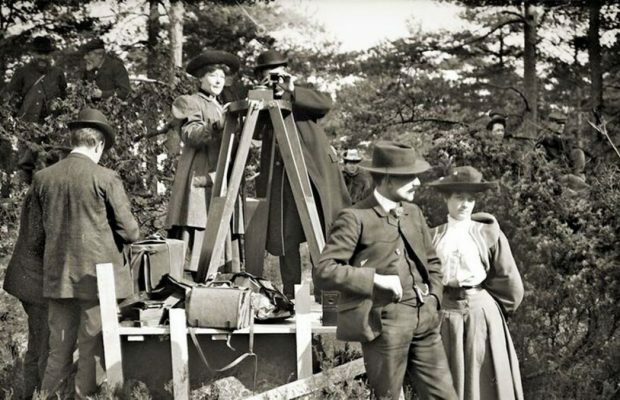 The screening I saw was in 3D, and while I’m generally not a fan, it wasn’t bothersome here. I didn’t get the impression that it made the image darker. On the other hand, I don’t think it added anything to the experience. It’s the kind of 3D that you forget about for most of the movie until the glasses start to weigh on your nose. 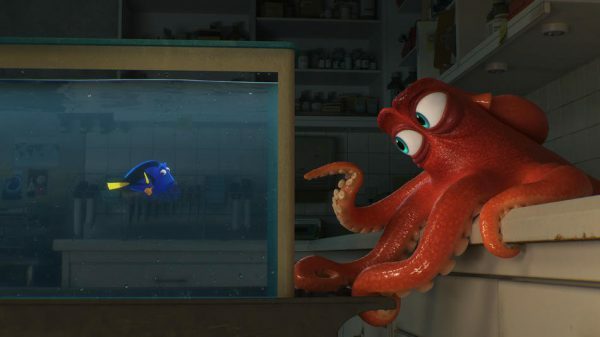 Finding Dory kicks off a string of Pixar releases that is sure to please stockholders as much as it annoys fans who prefer wholly originally ideas to sequels. Four out of the next five films cash in on pre-existing properties (Cars 3, Toy Story 4, and The Incredibles 2), with Coco, a film inspired by the Mexican holiday Día de los Muertos being the sole new property. I’ll happily go see Toy Story 4 and The Incredibles 2 — I love those characters and franchises — but I’d much rather see entirely new visions, worlds, and characters. Besides The Incredibles, none of my 5 favorite Pixar movies (Inside Out, Wall-E, Up, Ratatouille) have sequels, nor do they need them. If any of them are suited for multiple installments it’s Brad Bird’s epic family film, The Incredibles, which stems from movies steeped in a tradition of new installments — superhero films and the 007 franchise. 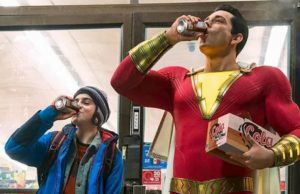 I think the original is the best superhero movie of all-time and I hope the sequel lives up to it. 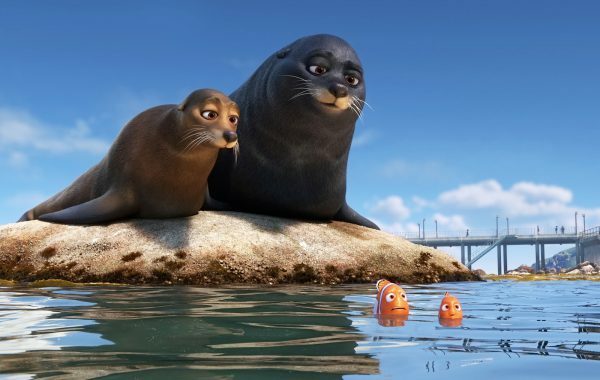 Finding Dory is not a film that we needed, but it’s here and its positives outweigh the negatives. I certainly enjoyed watching it.